Some great champions have helped me over the years with my training and diet who all become fantastic friends in person. These great men are Joe Weider the publisher of Muscle & Fitness, Jack LaLanne, the late legendary Godfather of Fitness, the greatest Mr. Olympia, Arnold Schwarzenegger and Larry Scott, the first Mr. Olympia. When I was 19 years old I called up Joe Weider at his office in Woodland Hills, California and asked him what I could do to win Best Abdominals in the Teenage Mr. Michigan. The tip Joe gave me was to use a 10 lb. weight plate behind my head when I do my situps on a slant board. I followed his training tip and won the trophy Best Abdominals in the Teenage Mr. Michigan. I told Joe and he put a photo of me in Muscle Builder with a write up. I won the trophy in 1978. The magazine is now Muscle & Fitness. When I was 16 years old I put a call in to the TV station where Jack Lalanne did his nationwide exercise show. Jack took the time to call me back and I was so excited to be talking with a legend. This was the start of a fantastic friendship. I eventually went to Jack's house in the Hollywood Hills and he showed me his personal gym where he trained. He had me do some exercises and talked all about training and diet. The great tip Jack gave me to get big muscles and have great endurance was to train with heavy weight and do 5 to 8 reps per set to build the white fibers, which get larger with this type of training. Do this for two weeks and then change over to doing15 to 20 reps of light weight to work the red fiber used for endurance. This program will make you bigger, stronger and give you great endurance. I first talked to Arnold Schwarzenegger on the phone at Gold's gym in Venice, California. 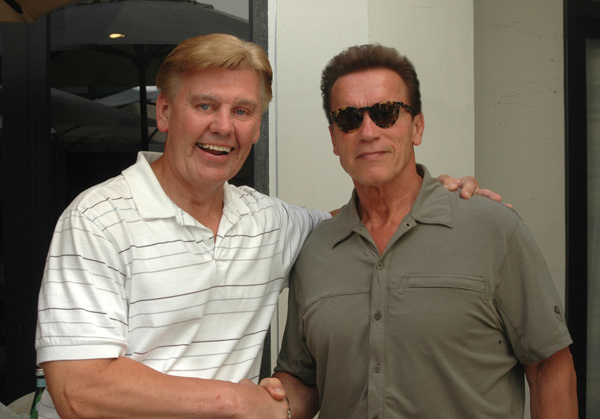 In later years when I would be in California I would meet Arnold at World Gym where he would help me with my training. Arnold always made time to talk and share training tips. One great tip Arnold gave me is when doing concentration curls with a dumbbell, you should turn your wrist a little and flex hard and to get a peak. This tip helped push my arm past 18 inches. I also met Larry Scott at the Arnold Classic. He was always so gracious. We became great friends and I would call him about every two weeks for training tips. Larry sent me his book Loaded Guns, autographed and free of charge. I asked Larry for a good tip to get my arms bigger? He told me to change my exercises each week to give the muscles a fresh start and use different angles. Larry sold me the Scott curling bench and the thick tricep bar. He always made time to talk to me and help me with my training. Many others have helped me, including a couple of people you should know. My good friend, and fantastic Hollywood photographer Rich Hogan who made all the photos of me possible. He took all the beach photos and weightlifting shots at Muscle Beach and made me look good. Rich is one of the best photographers in the world today.
. Shawn is always in fantastic shape. Just look in the front of the magazine and you will see he lives what he writes about. To all the readers of Muscle & Fitness, I wrote these tips from the greatest in the fitness business in hopes that you use them so you get good results in your workouts. For those readers interested in my booklet Developing Prize Winning Abdominals, it's for sale on Amazon. This little book is a complete abdominal course which will show you how to train your abs and what nutrition you need to achieve a stunning midsection. Bodybuilders, athletes and fitness people all can benefit from this simple, easy-to-follow course. Thousands of people all over the world have, now you can, too.